Perhaps the greatest challenge and triumph of art, is its ability to depict life's truths, no matter how sweet or bitter, in a way that always comes across as beautiful. Because it is art, people pay attention and are endlessly entertained. But like water to a rock, the message seeps deep inside and transforms the viewer, consciously or unconsciously. Such is the art of Harsh Gopal, an illustrator from Bangalore, India. He is a UX Designer by day and one popular potato on Instagram by night. On this social media platform, amid countless accounts of cats, vegans, travelers, and fitness bloggers, you will find the Truth Potato - a cute comic character that deals with life in an honest, straightforward, and mindful way. With subtlety, humor, and wisdom, every strip Harsh creates invites a meditation on being human, going with the flow, cultivating awareness while facing the realities of life, and having an open heart and mind in accepting universal truths regardless of how one feels about them. 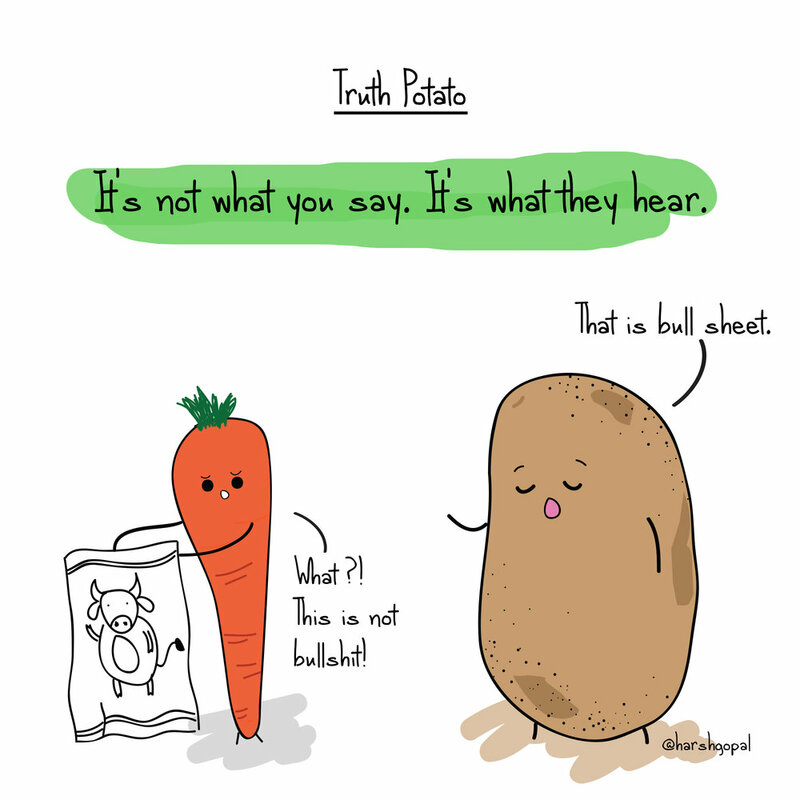 "Truth Potato was a character created to put those 'bitter truths' out there in the open, which everybody is normally in denial with. That was all the simple agenda for the character,” he explains. Harsh has been creating comics for Truth Potato since last year, after the character randomly occurred to him while he was sitting at home one evening after work and eating fries. And this indeed is the magic of Truth Potato. It is adorable, simple, and fun – but definitely real. This allows the lucid truths to shine. It is as Picasso said, "Some painters transform the sun into a yellow spot, others transform a yellow spot into the sun." But more than creativity, Harsh further adds that humor makes it easier to share an impactful message. "When there is a bit of fun involved, it’s always easier to create interest in whatever you are trying to say. Besides, nobody likes to be serious all the time, right?" This elemental lightness and playfulness may just be the reason why Truth Potato sees its fair share of followers on social media. The bio on the account reads “I potate from my inner wisdom, the truth of life.” For many, concepts surrounding universal truth, how to live a good life, awareness, mindfulness, and spirituality are met with simmering hesitation for these discussions can be airy-fairy or too esoteric, sometimes even dogmatic, and at worst, culty. But Harsh’ humor makes everything easier to digest, makes everything more approachable. It is very casual and grounded without losing its inherent vigor and impact. Harsh goes back to his younger days where he started drawing normal pencil sketches of random landscapes and his favorite anime characters. When he entered high school, he started a comic series that he drew on his notebook and his classmates would pass the notebook and take turns to read it. What he had was a physical output that he shared socially. Obviously, these days, the fruits of his creativity are easily seen by thousands through Instagram, his favourite social media channel. But with his art and inner wisdom, Harsh is already on the fast-track to making a difference, shedding more light into the human heart with every comic he shares. On the surface, it may seem fun and all too simplistic, but at a deeper level, Truth Potato is able to communicate a strong message of awareness, interconnection, resilience, and positivity. It is for a fact there exists many potatoes in the world, but this right here is definitely one-of-a-kind. The Truth Potato potates on Instagram @truth.potato. For more on grounded mindfulness and learning how to use social media positively, explore this magical holistic retreat with digital detox in Bali by Pangea.